Proform low profile high capacity oil pan. 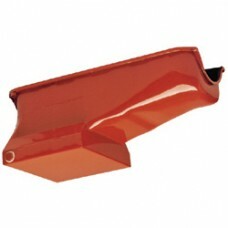 Good economical street/strip oil pan painted red/orange. Improved oil control and capacity over stock sump. Approximately 8 1/4" deep with 7 US quart capacity. Fits Small Block Chevrolet up to 1979 with left hand dipstick.